To find us drive 17 km north of Bega or 20 km south of Cobargo on the Princes Highway. From Canberra drive through Cooma along the Snowy Mountain Highway until the Princes Highway, turn left and drive 12 km north. Follow the turnoff to Brogo Dam on Warrigal Range Road and then drive 6.1 km from the highway to Fernmark (#610) on the RHS. Be careful of the wombats!!! 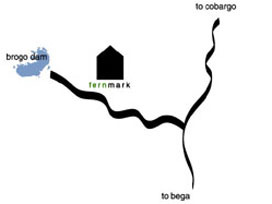 Fernmark is located in Brogo, between Sydney (5.5 hours) & Melbourne (8 hours) along the Princes Highway. It is an easy 3 hour drive from Canberra via the Snowy Mountain Highway. It is accessible by air with a short flight from Sydney or Melbourne (REX) to Merimbula airport - 45 minutes away. Buses run from Sydney, Canberra & Melbourne. When making your reservation we'd be happy to assist you with flight and bus times, and can organise rental cars.